An innovative programme has been developed in Portugal to address mental health problems in schools. The programme focuses on engaging with the education community and is a multi‐level approach to mental health promotion and suicidal behaviour prevention. By intervening with teachers and ancillary staff, parents and students, the aim of the service is to promote well‐being, self‐esteem and the development of coping strategies, as well as to combat stigma and depressive symptomatology. It is operated by primary health care professionals (mostly nurses but also includes some doctors, social workers and psychologists) who conduct educational sessions for the school staff and parents and socio-therapeutic sessions for the students. The burden of mental illness among teenagers is increasing. Despite this, due to poor mental health literacy, lack of access and stigma (particularly surrounding suicidal behaviour), only about 20% of those in need seek the help of a mental health professional. In addition, suicide is the third cause of death among teenagers, and self-inflicted injuries are increasing in this age group. Portugal has a shortage of health professionals trained to deal with mental health problems within the school context and obstacles in the access to specialized care, particularly in child psychiatry. A community intervention directed at the clearly deprived area of mental health, the programme uses an innovative approach comprising active dynamics, socio‐therapeutic and proximity games and the involvement of local health services. 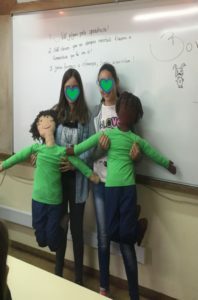 The success of the programme is due to the active participation of several local and national partners and the activities carried out in the classroom, in the whole school, in the community and across Portugal. The coordinating team consists exclusively of nurses (mental health and public health nurses) and the driving forces are also mainly nurses. The follow‐up of the teenagers and families is initially done by nurses at the local level. The most common situations are cases of mental suffering of different nature identified during the course of the programme (depressive symptoms, poor behaviour, low academic results, school dropout, etc.). When primary health care does not have the appropriate resources to manage the situation, the teenager is then referred to specialist services. This innovative programme has been implemented in several schools, local municipalities and the national network of health centres, and has increased its intervention year after year, presently extending to about 20,000 students, 3,000 teachers and ancillary staff and 2,000 parents. Over the seven years of the programme there has been a positive impact on the level of well‐being, self‐esteem, coping capacity and reduction of depressive symptoms. There has been significant improvements in the well‐being, coping, self‐esteem as well as a reduction in depressive symptoms leading to suicidal behaviours. Since the beginning of the programme, there has been an increase in the acceptance of this approach to mental health and suicidal behaviour in schools. At the same time, the programme has led to the identification of an increased need for extra school time in health and citizenship.